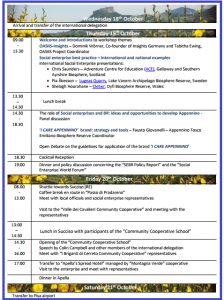 In October Assist Social Capital co-hosted an event in Appennino Tosco Emiliano Biosphere Reserve, Italy. The event aimed to bring businesses from UNESCO Biosphere Reserves (BRs) together to hear and discuss role of businesses within UNESCO BRs. 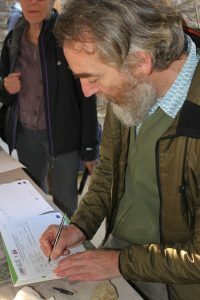 Social Enterprises from BRs in Sweden, Scotland and Wales met with enterprises from Appennino Tosco Emiliano BR, and explored the benefits of UNESCO BR designation for business, the potential networks and markets which can be opened up from registration on the OASIIS Platform, and also took part in the launch of the new I Care Appennino brand. The trip to the “Appennino Tosco Emiliano” Biosphere Reserve was an opportunity which I am pleased I did not turn down. As a social entrepreneur it is important to make the most of opportunities as you never know where they might lead. But it’s also important to manage your time appropriately, value for the organisation is paramount when considering pieces of work that can lead to organisational prosperity. This opportunity fitted into several areas for us. Firstly as part of our value base the sharing of our experience and how we became a successful social enterprise is important. The knowledge that we have gained from over ten years of experiences can help others in the pursuit of their aspirations. Also being situated in a biosphere reserve we feel it is important to share how the symbiosis of the two work together. This event was an opportunity to foster discussion about what it means to be a social enterprise within a European Biosphere Reserve and what role do social enterprises play. Secondly this event was a potential business opportunity. A chance to see a new area, and meet new contacts. A chance to tentatively explore the prospect of either working in partnership with similar organisations or creating adventure tourism packages as a bolt on to the work we already do. This trip hit both of these milestones for us. The trip was really well organised from both sides with good pre trip information and a quality service when we arrived in Italy. Filippo the event organiser had laid on a packed itinerary of events for us to attend as well as the provision of excellent accommodation and hospitality. The events themselves gave us the opportunity to talk about our respective organisations and our experiences of being a social enterprise in a Biosphere. These presentations were gratefully received with positive feedback from those who attended. But key for me was the opportunity to talk to some of those present. Here I got to meet with other businesses that operate in a similar field. That being outdoor activity provision in an education and commercial sector. From these initial meetings we are looking at how we can take these connections to the next level so that we can learn and share from each other for the greater good. At the heart of what our organisations do is the development of people and a care for the natural environment. These core values surpass the difficulties of language and culture and with this intrinsic body of knowledge a spark of interest to connect and share has been ignited. From this spark we plan to forge future links to develop these initial ideas and to see where we can take our Biosphere connections in creating prosperity through our respective organisations. This would not have been possible without our being part of the OASIIS network. Also our organisational host made sure that the events were appropriate and the right connections were there for those of us that attended. 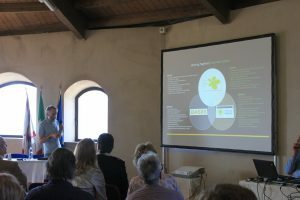 It was also a privilege to play part in the development of the Appennino Tosco Emiliano Biosphere Reserve discussions on their development of the brand “I care Appennino”. I was able to share my experience of being a ‘Proud supporter’ of the Galloway and Southern Ayrshire Biosphere and how best ACE/Adventure Carrick could build on the Biosphere UNESCO status. ACE are presently in the process of joining the Galloway and Southern Ayrshire Biosphere certification process for Activity Providers. This new process will be rolling out in 2018. Some of the potential plans for the future discussed since this trip include the research of other outdoor providers within the world Biosphere reserves. Contacting these organisations and creating a network in the hope that these links generate potential collaborations and knowledge sharing. This will obviously require some research time but we see the potential opportunities of a world network of outdoor providers living and working in Biospheres and the potential marketing that could come from this. 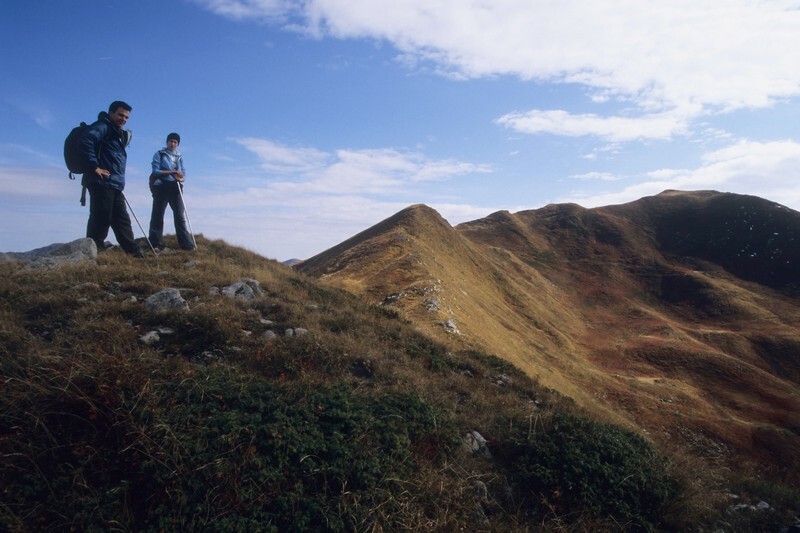 We will also be exploring the potential opportunity of creating an outdoor activity holiday package based in the “Appennino Tosco Emiliano” Biosphere Reserve that ACE could market in 2018/19 and utilizing our new found contacts. ACE would like to give their up-most thanks all those who made this a worthwhile and valuable trip.